That piracy has to be fought onshore in Somalia has become a truism. Somalia needs stable governance structures, a coastguard, and a strategy to fight piracy. Put differently, a Somali maritime security policy is needed. Some efforts into that direction are currently underway. The Mogadishu Roadmap, the outcome of a three day consultative meeting in the Somali capital, is the most ambitious attempts to establish such a maritime security policy for Somalia. The meeting, which took place between September 4 and 6, aimed primarily at developing a plan to stabilize Somalia and to end the transitional period (in place since 2004). Yet it also tried to pave the way towards a maritime security policy for Somalia. It would be the first such policy for Somalia since the disintegration of the central state in 1991. But what are the maritime security challenges that such a policy needs to target? And how can you create and implement a maritime security policy and strategy in a fragmented country like Somalia? Does the Mogadishu Roadmap address these challenges? Does it provide a meaningful framework to increase maritime security off Somalia? These are some of the questions that this contribution will try to answer. So let us begin with a brief overview of maritime security challenges off Somalia. However, as indicated by Somalia Report, piracy is not the only maritime security challenge in Somali waters. Illegal, Unregulated and Unreported fishing (IUU) and toxic waste dumping have reportedly become rampant and threaten the livelihood of coastal communities (Beerdhige and Deperani 2011). This is made worse by warlords, regional governments and shady businessmen issuing fishing licences to foreign trawlers. Given that fishing vessels are usually armed, the situation in Somali waters often renders naval warfare. Moreover, Somalia’s waters have also become famous for many other criminal activities, including smuggling, arms trafficking and human trafficking. Also transnational criminal organizations and Somali Islamists groups have been involved in such activities (e.g. UN Monitoring Group on Somalia and Eritrea 2011). Hence there is a great need to quickly develop and to implement a maritime security policy for Somalia that will tackle the above mentioned criminal activities and security threats along its 3000 km coastline. Yet that’s easier said than done. There are indeed some very good reasons why Somalia did not have such a policy and a coastguard for the past twenty years. So before analyzing the Mogadishu Roadmap let us first look into the challenges ahead of such a venture, which problems for engagement they pose and how they can be addressed. One of the primary issues to be addressed is how and by whom Somalia’s waters should be administered. Somalia is fragmented and politically divided. The internationally recognized Transitional Federal Government (TFG), which is nominally in charge of managing the sea, is in fact a city state that simply lacks the capacity as well as the legitimacy to take control of anything beyond the capital Mogadishu. This also includes the sea. The Somali coast is thus divided between different and often competing and conflicting regional states and administrations: Somaliland in the northeast, Puntland in the northwest, Galmudug, Himam and Heb and Ahlu Sunna Wal Jama in the central regions and most of the south is controlled by Al-shabab, a militant Islamic organization on a crusade against the rest of world. Hence Somalia’s maritime security policy needs to be all-inclusive. It has to provide a framework where regional states and the TFG can jointly govern maritime security issues. Given that maritime criminal groups operate across onshore territorial boundaries, cooperation between regional states is in indeed essential. Such efforts have already been undertaken through the Kampala process, which brings together the TFG, Puntland and Somaliland to discuss counter-piracy issues. Yet the Islamists of Al-shabab will not be included in such an arrangement due to their staunch opposition to the western backed TFG. It is also unclear in how far the self-declared Republic of Somaliland will participate in a joint security policy for Somalia. Developing a joint maritime security policy for Somalia is thus about getting the TFG and regional states onboard and establishing a pragmatic working relationship with Somaliland. Yet relations between the TFG and regional states (as well as among regional states) are very strained and cooperation often weak. Regional authorities generally try to maintain their independence while the TFG is not committed to political devolution and resources sharing (e.g. International Crisis Group 2011). Hence to guarantee that at least the remaining regional authorities participate in a joint maritime security policy, their relations to the TFG (and among each other) need to be clarified. Mutual duties and responsibilities have to be established and transparent mechanisms need to be developed where maritime security and governance issues can be discussed, planned and implemented jointly. Given that illegal fishing is a major concern in Somalia (Waldo 2009), and since it is used by pirates to justify their activities, any maritime security policy also needs to tackle maritime resource governance (e.g. UN Monitoring Group on Somalia and Eritrea 2011: 116). On the one hand Somalia should establish a 200nm Exclusive Economic Zone, where it enjoys primary resource exploitation and management rights. Normally the United Nations Convention on the Law of the Sea 1982 (UNCLOS) provides for such a secured space. Yet Somalia has not yet signed UNCLOS (at least no such proof can be found at the UN archives in New York while in Somalia most documents have been lost during the war). In the 1970s Somalia had apparently declared 200nm territorial waters. But because such a move is not recognized by international law, it can only claim jurisdiction and economic rights over its 12 nm territorial waters (which are recognized in UNCLOS). Signing UNCLOS and creating an EEZ would do much to settle this issue – at least from a legal perspective. Seen from international law, there cannot be illegal fishing off Somalia’s coast, if no EEZ has been claimed. Hence, this is a crucial step. Since Somalia does not have a coastguard, much will depend on the international community and naval forces to make sure that the EEZ is enforced and illegal fishing will actually be prevented. On the other hand, however, maritime resource governance also needs to tackle the unregulated issuing of fishing licences by competing Somali authorities. A single technical commission or authority to oversee the licensing process would be a step into the right direction. Moreover quotas need to be established to regulate the number of licences issued and it must be made clear which authority is illegible to grant fishing rights. Dividing relations, duties and responsibilities between the TFG and regional authorities will not be enough to counter insecurity and crime in Somalia’s waters. A joint maritime security policy for Somalia will have to address the state of lawlessness in coastal regions and make sure that governance structures are extended to remote coastal areas and villages. Coastal areas are only sparsely populated and economically and politically marginal. The predominantly pastoral Somali population is concentrated in the hinterland, where water, rain and pasture are more abundant. Coastal villages such as Bargal, Eyl and Garacad (Puntland) and Hobyo (Galmudug) and Haradhere (currently al Shabab) are far off from economic and power centres in the hinterland (e.g. Garowe, Galcayo, etc), to which they are only loosely connected through clan ties. Many regional states (with the exception of Somaliland) can indeed be characterized as hinterland or highway authorities: their power does not extend far beyond the main tarmac road that connects Somalia’s main administrative and commercial centres. Thus not only do they lack (proper) coastguards, but their influence in coastal areas is in fact rather limited or even non-existent. Himam and Heb and Ahlu Sunna Wal Jama apparently do not even have a presence at the coast. Moreover basic infrastructure and social services are often non-existent. There is a lack of schools, hospitals and roads. The fishing industry, the economic mainstay in coastal areas, has declined during the civil war (also because of illegal fishing) and basic infrastructure and social services are absent. Poverty is widespread and reportedly fuels criminal activities such as piracy. Regional states and the TFG thus have to expand their authority and need to build up governance and security structures in neglected costal areas. Another option would be to directly strengthen local governance systems, such as local administrations and councils of elders, without going through regional states. Moreover, development programs have to be launched to address the needs of local population, to reduce incentives to engage in criminal activities and to make alternative sources of income available. Such activities have partly already been launched by international NGOs (e.g. Bueger et al. 2011). After having declared an EEZ, developed a participatory framework for maritime security governance and drawn plans of how to extend governance and development to coastal regions, the remaining question is: who supports and pays for the implementation of these activities? Establishing a well equipped coastguard and expanding security and development efforts will not come cheap. Left alone Somali regional states and the TFG will certainly not be able to implement these measures. As pointed out before, with the exception of Somaliland they are barely able to maintain peace and security in major cities. Thus the international community has to step in to support and to finance the implementation of a joint maritime security policy for Somalia. Thus the international community has to think about how it can support the implementation of a joint maritime security policy for Somalia. As indicated before, Somalia is a complicated environment where different governance structures overlap and compete. Just putting money into regional administrations, or even strengthening their military capacities to fight piracy, can easily backfire and fuel conflicts in Somalia. Thus the international community has to think about with whom they can cooperate and what kind of support they can provide. Moreover it has to make sufficient financial resources available and make sure that counter-piracy programs in Somalia do not undermine ongoing development and stabilization efforts by other actors (Bueger, Stockbruegger and Werthes 2011). Let us now look into the Mogadishu Roadmap to see in how far it addresses the issues and challenges mentioned above. But first some background information about the meeting. 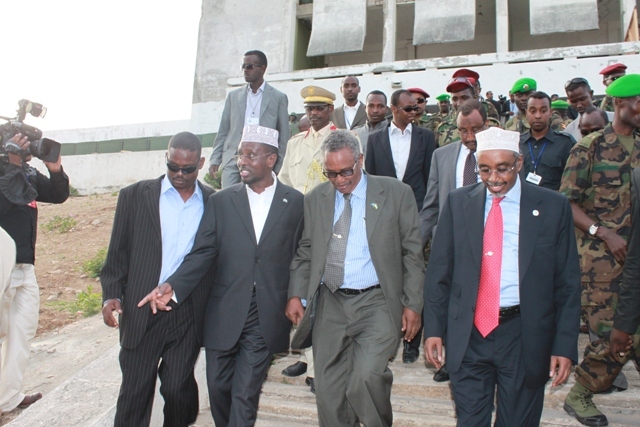 From September 4-6 a three days consultative meeting on Somalia was hold in Mogadishu. It was the first such meeting hold in the Somali capital since 1991 (previous meetings took place outside Somalia mainly due to security concerns). The meeting was facilitated by the United Nations Political Office for Somalia (UNPOS) and brought together the Transitional Federal Government and the regional authorities of Puntland, Galmudug State and Ahlu Sunna Wal Jama (although only the Mogadishu branch of the fragmented movement, see Africa Confidential 2011). Also the African Union, the Interregional Authority on Development (IGAD), League of Arab States, the Organisation of the Islamic Conference (OIC) the European Union and other donors participated in the meeting. The aim of the meeting was for the TFG to reach out to regional authorities and to design a plan to stabilize the country and to draft a road map for an end of the transitional period (which had just been extended until August 2012). The meeting was thus not “political” and the concluding agreement, the Somali End of Transition Roadmap, is a rather technical document putting forward clear measures and deadlines to end the transitional period within the coming months. The full agreement and the statement can be obtained via UNPOS. The Mogadishu Roadmap aims at integrating maritime security efforts into a general plan to stabilize Somalia and to end the transitional period. Benchmark 1b (on security) of the roadmap deals with maritime security issues and lays out a framework for developing and implementing an “Effective maritime security and counter-piracy policy and strategy” to “prevent piracy and protect Somalia natural resources”. The policy is to be finalized by January 2012, and a strategy for implementation is to be drafted by March 2012. The document highlights that such a policy should be formulated “in conjunction” with regional administrations, in particular “Puntland State of Somalia and Somaliland”. They are the only regional entities mentioned in the maritime security section, though Somaliland did not participate in the meeting. On the TFG side the Ministry of Fisheries, the Ministry of Transport and Ports and the Prime Minister are in charge of the process. No such stipulations are made on the side of regional states. Also international actors, namely the UN, AU and IGAD, are to become involved. The policy furthermore highlights the Kampala process and the Contact Group on Piracy off the Coast of Somalia as the prime mechanism through which dialogue between Somali regional states, the TFG and the international community is to be achieved and financial resources for implementation are to be gathered. The first step is the declaration of an EEZ for Somalia to lay claim over its marine resources, primarily fishing (there are also speculations that oil might be found in the future), and to establish its responsibilities in securing this area, both from illegal resource exploitation and piracy. The Prime Minister of the TFG is to become the “special envoy for EEZ issues”. Parliament is already debating the declaration of an EEZ. Furthermore a “Counter Piracy Coordinator” is to be appointed and “programmes for anti-piracy community engagement and linked coastal economic projects” are to be developed. Phase one is to be concluded by December. In phase two, to be concluded by March 2012, the TFG and regional authorities are supposed to have agreed on a “maritime security strategy”. This is to be achieved through the Kampala process. Moreover the implementation of anti-piracy community programs and coastal development initiative has begun. In this context some international NGOs have already begun to plan and implement piracy programs. In the final phase, until May 2012, participants are supposed to agree to “Build capacity to prosecute, try and imprison piracy and maritime law case”. Such efforts are already underway under the Counter-Piracy Program of UNODC and the Rule of Law Program of UNDP. Moreover, the documents envisions to “Enact Anti-Piracy Legislation”. The document also envisions to “Establish Somali Maritime Police Force/Coastguard(s)/Coastal monitoring capability, coordinated with land police force(s)” seems to be a long-term goal. Though it has not been given a deadline and seems to be a long-term goal. Given the difficulties of engaging Somali actors and supporting security sector reforms, soft development and capacity measures are given priority. So, will the High-Level Consultative Meeting result in a meaningful joint maritime security policy for Somalia? 4. A joint maritime security policy for Somalia in the making? Establishing a joint maritime security policy for Somalia is a very ambitious and difficult task. Nevertheless it is also a necessary and a possible task. The Mogadishu Roadmap targets the main maritime security challenges off Somalia, namely piracy and illegal fishing. It is a flexible plan that addresses many, though not all, political and security problems ahead, and its success will depend on how it is actually implemented. The Roadmap aims at including regional authorities, the creation of a common policy agenda and platform, and it puts forward mechanisms (the Kampala Process, the Contact Group) where regional authorities and the TFG can cooperate on maritime security issues and where financial resources can be gathered. Given its strong emphasis on development, capacity building and legislative components, rather than on security sector reform (no deadline for establishing a coastguard), shows that the international community is well aware of the problems of engaging in the military sector in Somalia and providing direct military support to Somali actors. Moreover, the Roadmap recognizes the need for coastal development programs to decrease piracy incentives and to make alternative income generating activities more attractive. Yet some points are unclear and vague, for instance the “programmes for anti-piracy community engagement”. Whether this includes strengthening governance systems in coastal areas remains to be seen, though current activities indicate that such programs primarily aim at wining the hearts and minds of local communities through awareness raising and development initiatives. The document is also silent about further steps to protect and to regulate the Somali fishing sector and how such and other activities will be supported by the international community. Morever, since only the Mogadishu section of Ahlu Sunna Wal Jama attended the meeting, efforts are needed to reach out to other branches of the movement, espeically in the central regions. These are issues that will have to be addressed when designing a joint maritime security policy for Somalia. However three issues seem to be more fundamental and it is doubtful whether they can be solved in the context of the Mogadishu Roadmap. First, it is very unlikely that the Roadmap will attract any cooperation from the Somaliland side, since it would mean recognizing the TFG and its authority on maritime security and EEZ issues. Somaliland would in fact give up its self-proclaimed sovereignty. It is because of that reason that it is reluctant to participate in such meetings, including the most recent one in Mogadishu. However Maritime security is a common interest and Somaliland has previously participated in informal talks with the TFG and Puntland on piracy (e.g. the Kampala process and also in the Contact Group). But linking maritime security to recognizing the TFG does not make use of that opportunity for cooperation. If the international community is really interested to get Somaliland onboard, and it should be given that Somaliland is the most established regional state and that it controls a long stretch of coast, it should consider a more informal and flexible mechanism that allows Somaliland to engage in a joint maritime security policy without having to recognize the TFG. Second, the technical nature of the roadmap and its tight deadlines leave little space for discussing and addressing some of the more complicated political issues on maritime security governance. The current approach definitely has the advantages of not opening the box of Pandora and having to engage in heated debates about the nature of maritime security governance (e.g. is the TFG the legitimate leader in that process). However Somalia did not have a maritime security policy for two decades and this for Somalis so important policy issue, one think about illegal fishing, has never been discussed in a policy context before. Thus more time and public debate would probably be necessary to create a legitimate maritime security policy that is based on the consent of all stakeholders and that is also supported by the broader public. Thirdly, much will depend on the support of the international community in supporting the initiative. International actors will have to be careful not to stipulate solutions to Somali actors, but ensure ownership. Somali will have to find and develop their own home grown solutions. International support should not go beyond the provision of resources and technical assistance. This is not the least to avoid undermining the legitimacy of the roadmap. Fortunately, the United Kingdom has already announced to support the implementation of the Road Map with a significant amount (4 million GBP), and according to Security Council Report (2011) a UN Security Council Resolution is on its way, which will endorse the Road Map and caller for some further substantial support. Anyway, let us wait and give it chance. After all the Mogadishu Roadmap is the first serious attempt to create a joint maritime security policy for Somalia. And it is definitely worth trying out and learning from mistakes – as we have done for the last two decades. Africa Confidential (2011) Al-shabab sets the Agenda, Africa Conidential 52, 20: 10. Beerdhige, Mohamed and Deperani, Jama (2011) Vessels damage Puntland’s fishery industry, Somalia Report, 27.09.2011, at http://somaliareport.com/index.php/post/1648/_Vessels_Damage_Puntlands_Fisheries_Industry . British High Commission Kenya. 2011. UK Outlines robust measure on tackling piracy, http://ukinkenya.fco.gov.uk/en/news/?view=News&id=669693482. Bueger, Christian, Stockbruegger, Jan and Werthes, Sascha (2011) Pirates, fishermen and peacebuilding: options for counter-piracy strategy in Somalia, Contemporary Security Policy 32, 2: 356-381, at http://www.tandfonline.com/doi/abs/10.1080/13523260.2011.590359. International Crisis Group (2011) Somalia: the transitional government on life support, Brussels, at http://www.crisisgroup.org/~/media/Files/africa/horn-of-africa/somalia/170%20Somalia%20The%20Transitional%20Government%20on%20Life%20Support.pdf . Somalia Report (2011): Into the heart of the Pirate Lair, Somalia Report 13.04.2011, at http://somaliareport.com/index.php/post/521/Into_the_Heart_of_The_Pirate_Lair. United Nations Monitoring Group on Somalia and Eritrea (2011) Report of the Monitoring Group on Somalia and Eritrea pursuant to Security Council Resolution 1916 (2010), S2011/433), at http://www.un.org/ga/search/view_doc.asp?symbol=S/2011/433 . Security Council Report. 2011. Somalia Piracy resolution, at http://whatsinblue.org/2011/10/somalia-piracy-resolution.php.